I visited a bee farm last weekend! Being someone with a fear of bees (maybe not enough to be legitimately diagnosed as melissophobic, but still), I had no business being on a bee farm. But this wasn’t just any bee farm though; This was a kelulut bee farm. Kelulut bees, or lebah kelulut, is what us Malaysians call stingless bees (often of the Tetragona or Trigona genus). These bees are about a third the size of a regular honey bee, don’t have a sting, and just buzz around pollinating flowers all day without being overly aggressive about it (unlike a certain bumbly bee). Best of all, kelulut bees make a really unique, naturally sour honey! So with the promise of great honey, and with my fear of accidentally initiating a Tom-and-Jerry-esque bee chase sequence greatly assuaged, I visited the farm. When we think of a bee farm, we’d usually picture neat little rows of man-made hive boxes, carefully tended to by hazmat suit-wearing beekeepers. Kelulut bee farms, on the other hand, are quite the opposite. These stingless bees are known to build their hives in the hollow trunks of very specific species of wild trees (like meranti or jelutong trees in Malaysia). So to start a kelulut bee farm, one has to find these bee-infested trees in the wild and cut down the particular section of the trunk that the queen bee is housed in, and either extract the colony or transport the whole trunk section to the farm. Surely enough, at this particular farm I visited, the beehives were just a jumbled bunch of mismatched tree trunks. The log-hives were all haphazardly propped up on stilts on the side of a hill. (See photo!) And in each hive, there reside a colony of thousands of bees. Now being within close proximity of two dozen colonies of bees (totaling >20,000 individual bees) might seem a little daunting, but these kelulut bees are so Swiss-like in their demeanour that there's nothing to fear at all! All around the hives, chickens and ducks and goats and farmhands roam freely, all coexisting in this laid-back farm environment. Super idyllic. But don’t let the rural, placid vibe of these kelulut bee farms fool you. At four or five times the price of regular honey, kelulut honey is a goldmine for these farmers. Sure, the process of domesticating these bees requires some effort, but the high price the honey can fetch makes it a more than worthwhile investment. In the past few years especially, kelulut bee farms have been popping up all over Malaysia, contributing to the honey craze silently sweeping the nation. Whatever dodgy, pseudo-sciency medicinal value this kelulut honey has though, I wouldn’t have cared much for it if it didn’t have any culinary value. But boy does it deliver on flavour! The number one thing that makes kelulut honey distinct from your regular, run-of-the-mill honey is that instead of having that fruity sweetness often associated with honey, kelulut honey is sour. Yup, you heard right. It’s SOUR! Crazy, no? Each time I taste this honey, I'm just continually mind-blown and overwhelmed by the culinary possibilities it offered! You could drizzle it over any summer salad and make a great vinaigrette out of it, use it as a base for sauces and marinades, and probably make some interesting cocktails out of it too! Being the fermentation fanatic I am though, I was instantly compelled to use it to make a fermented garlic honey. This might sound like a big project, especially with fermentation involved, but it honestly couldn't be easier. You literally just put garlic and honey in a jar, leave it to do its thing for a few days, and voila - fermented garlic honey. I mean, even with a broken arm, this was deceptively easy. Fret not if you can’t find kelulut honey though, as regular honey works too. The only catch here is that because most honey is just purely sweet, bacteria will be able to grow in it and consuming the honey might give you botulism (which is a seriously deadly disease). So with normal honey, it’s highly recommended to add a few spoonfuls of vinegar to bring down the pH of the honey to below 4.6, which kills off the botulism bacteria. This, however, might give the honey that characteristically sharp zip of vinegar, which isn’t always all that pleasant. 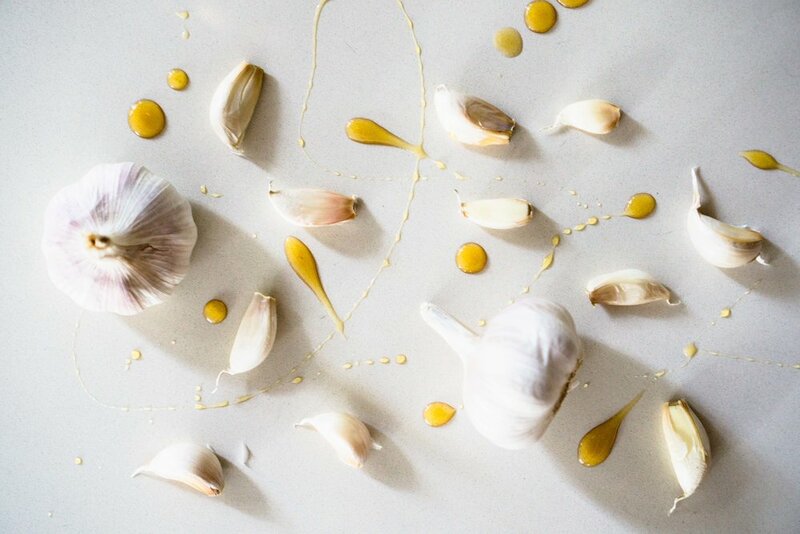 Whichever route you go down though, by fermenting the garlic in the honey, the pungent spiciness of the garlic will be mellowed out, making way for a deep, almost spiced sour-sweetness. Like raw kelulut honey, this would work great as a salad dressing or a sauce. Only this time round, it’d have a nice garlicky punch to it, and a more complex profile from the fermentation. My favourite use of it so far (courtesy of BA’s Brad Leone) is to drizzle it on pizza! Imagine it drizzled onto a crusty Neapolitan, with a generous dose of buffalo mozza, some fresh basil leaves, juicy-sweet San Marzano tomatoes (the real stuff), and maybe even a few briny slivers of anchovies. MMM, that is a P-I-Z-Z-A. Here’s a tip though - don’t have it on rye toast with cream cheese. Just don't. Peel the garlic and cut off any ‘boo-boo spots’, as Brad Leone puts it. Give it a light bruise with the flat side of your knife, and place it in a small, airtight jar with the honey. Make sure to leave some headspace in your jar as the honey will start to bubble a little as it ferments. Give it a shake so the honey coats all of the garlic, and keep it at room temperature, away from direct sunlight, for at least 5 days. Open the jar to burp the air out every 2-3 days. The garlic honey can keep at room temperature for many months, and some people have even kept theirs for years! As long as it remains pretty acidic (below pH 4.6), it’ll last for as long as you keep it. Drizzle the honey over pizzas and salads, pop a candied garlic down the hatch whenever you feel like it, or have a spoonful of the honey every day to boost your immune system!